This 4 channel chaser runs�3-7 feet of EL Wire per channel and comes with plugs so you don't have to solder. This 4 channel driver is a Constant light & flash show . Uses 4 AAA batteries (not included) so you can make it mobile. Use it with pre-connected El Wire for simplicity or attach a lead to each section of your EL Wire and you can swap their locations on the Constant light & flash driver as you please. Each channel needs to have a load (EL Wire) on it for the driver to run. 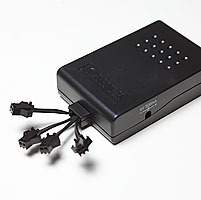 Do not operate without EL Wire on each connector. This can damage the unit! Runs off 110 volt or 4 AAA batteries. Comes with 4 EL Wire leads and on/off switch. Dimensions: 3.5" x 2.25" x .875"